Would a mini bbq grill be complete without it's own bbq cover? Of course it wouldn't! These prototype mini bbq grills and cover are one of a kind. 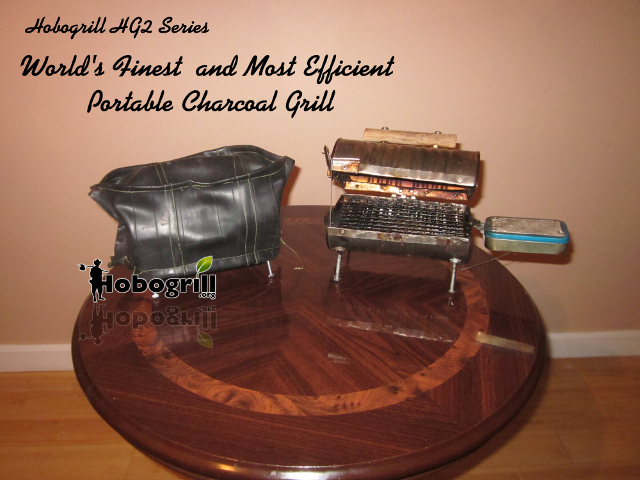 As of this writing this is only one of two mini bbq grill covers I ever made for the hobogrill. One was for an HG1-prototype and the other for this HG2-prototype grill as pictured above. It's crafted from a high quality rubber bicycle innertube sewn together with very strong UV resistant thread. It fits snug over the hobogrill.